The Resource Center provides information regarding the machines we manufacture and other related matters. Is an additional power supply or circuit rewiring required to operate the HX Series II benchtop CNC machinery? A: No. All of our products are designed to operate within U.S. standard, single-phase, 120VAC, 60HZ, and pull less than 15 Amps. Why won't my HX Series II Benchtop CNC machine connect to my computer? 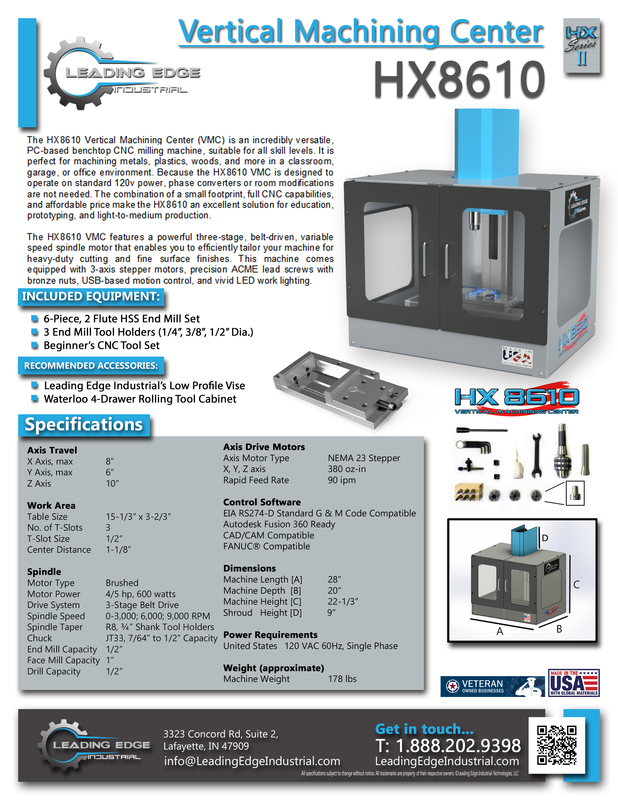 What is included with purchase of the HX Series II Benchtop CNC machines? A: Please see the packing list for a current list of tools and accessories, located on the product pages of our HX Series II Benchtop CNC machines and within the User Manuals. What kind of factory warranty is included with purchase of the HX Series II Benchtop CNC machines? A: We offer a 1-year, limited parts replacement warranty. This warranty does not include damage caused by the user. More detailed information can be found in our user manuals. Can we use longer USB cables? A: Certainly! The USB cable provided with your purchase of the machine is a standard USB-A to USB-B cable and can be purchased at almost any store. Because of each installation, classroom, and/or shop floor layout is different for all of our customers, we only stock 6-foot USB cables. With that said, we have successfully used a 20-foot cable to control our machines in a previous shop floor layout. A: The HX Series II Benchtop CNC product line has been designed to operate on industry standard G- & M-codes generated from post-processors built into CAD/CAM software packages like Autodesk Fusion 360, SolidWorks – MasterCAM, CAMWorks, and more! Simply connect your HX Series II Benchtop CNC machines to a computer using our LEAD Controller software, via the provided USB A-B serial communications cable, and you are ready to machine! What controller is used to operate the HX Series II Benchtop CNC machines? A: Our LEAD Controller – This software controller is a Java-based, cross-platform controller, designed for use with Leading Edge Industrial’s HX Series II Benchtop CNC machine product line. What are the machine footprints? A: Please see the specification sheets for the most up-to-date sizing information, located on the product pages and within the User Manuals. Do I need to buy a tool cart? A: The Waterloo tool cart is a Made-in-the-USA add-on, and is not required to operate the machines. We offer this product for convenience, movability, and a better user-experience for our customers. Can I seal the sheet metal enclosure with silicone for use with my coolant system? A: Yes, you can use a silicone sealant if you wish. It is not a service we offer, but it could be easily implemented if you find it necessary. Can I install a coolant drain line through the sheet metal enclosure? A: Our cases were not designed to be used with flood coolant. Any modifications to the machine for such purpose would be up to the customer. Leading Edge Industrial’s limited warranty on parts does not cover any after-market modifications made to the sheet metal enclosure, nor does it cover any damage caused by a leaking case. The machines are designed for use with mist coolant only, and when properly set-up will not accumulate large amounts of coolant at any time. If a large amount of coolant is collecting inside the case, then a coolant feed adjustment is necessary. What is maximum turning diameter, and what’s the maximum stock I can chuck in it? A: The pre-installed 3″, 3-jaw chuck will hold a maximum of 3-inch diameter stock. The chuck has 0.625 inch thru holes. The HX710 Turning Center has a work capacity of 7″ x 10″; however, we recommend working within the 3-inch diameter limits. Can I install a bigger chuck? A: Yes, the 3″ 3-jaw chuck, that comes pre-installed on the machine, is removable, and can be replaced with a larger chuck. The user manual for the HX710 Turning Center has the steps listed within it to walk you through proper removal and installation of a new chuck. We only carry 3″, 3-jaw chucks in inventory. How does the machine cope with cutting stainless steel? A: We currently do not have experience running stainless steel on the HX710 Turning Center. We will be cutting a variety of metals in the coming weeks, stainless steel included. The HX710 Turning Center can cut wood, plastic, steel, aluminum, and titanium. Are there any coolant ports on the HX710 Turning Center? A: The HX710 turning center currently does not have ports for coolant. We recommend a mist coolant system with a magnetic base. Installation of a coolant system is up to the purchaser. Available today within MasterCAM via the machine’s respective FANUC-generic [Mill / Lathe] post processor. Leading Edge Industrial’s machine-specific, MasterCAM post processor is under development. Pay close attention to the machine type and series version prior to downloading and running the programs below. Click Here it give us some feedback.